Floods, hurricanes, earthquakes, wildfires, house fires, and toxic spills necessitate rapid evacuation, and it may be impossible to gather supplies at the last minute. 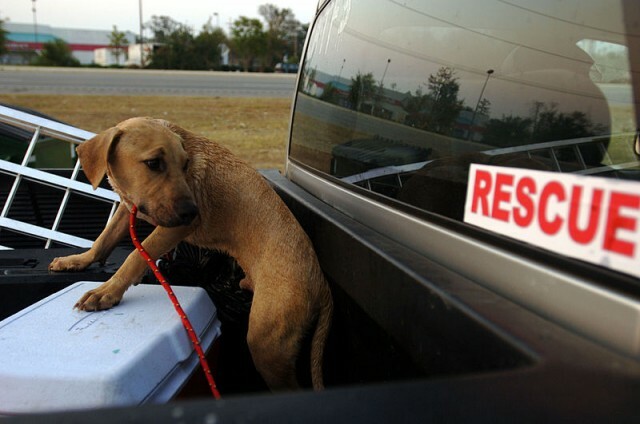 Leaving animals at home during a disaster is often a death sentence. Frightened pets may starve, succumb to thirst, or escape outdoors, falling victim to predators, accidents, or contaminated water and food sources. Pet owners may not be home when disaster strikes, so a key should be left with a trusted nearby family member, friend, or neighbour. Arrangements should be made to meet at a designated location in the event of a disaster and/or evacuation order. Be sure to tell your backup person where your pet is likely to hide if frightened, provide a list of contact numbers where he or she can reach you, and make sure pets are wearing ID at all times. Getting an implanted microchip increases the chances that your pet can be identified and returned if lost. When returning to your home after an evacuation, keep pets indoors until all problems (i.e., debris, contaminated water, etc.) have been cleared away. If you have an outdoor cat, block the cat door and be careful that he doesn’t escape outside until things have settled down. Cats are particularly likely to become frightened by the chaos, and may run off or become lost if familiar scents and landmarks have been changed. For more information on disaster preparedness, call 1-800-BE-READY or visit www.ready.gov. Reference: American Red Cross. (2008). Cat First Aid. Yardley, PA: StayWell.